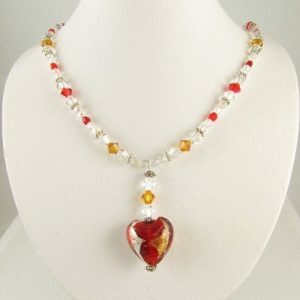 Elegant Hemalyke Siam necklace – handcrafted with Hemalyke beads and rondelles and Swarovski bicone crystals. 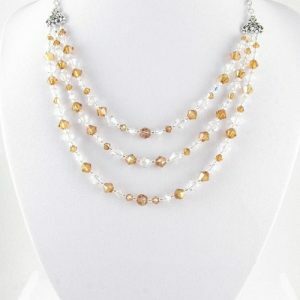 Elegant Hemalyke Topaz necklace – handcrafted with Hemalyke beads and rondelles and Swarovski bicone crystals. 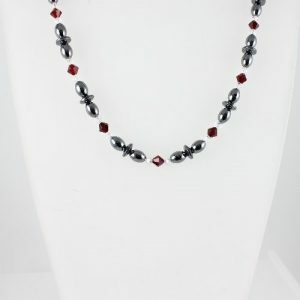 Beautiful Mother-of-Pearl necklace with dark rose Mother-of-Pearl beads, freshwater beads and a carved river shell pendant. 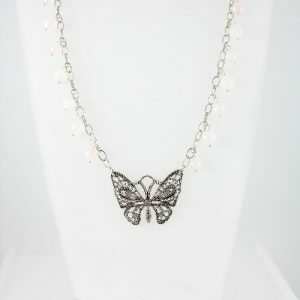 Handcrafted butterfly necklace with Rose Quartz beads on an antique silver plated chain. 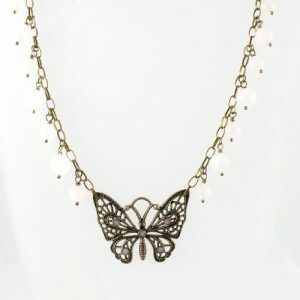 Handcrafted butterfly necklace with Rose Quartz beads. 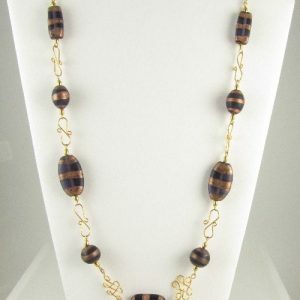 Necklace with purple bronze glass beads – handcrafted with purple and bronze glass beads, gold plated rice beads and gold plated wire. 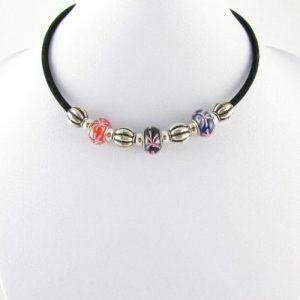 It closes with a gold plated lobster clasp. 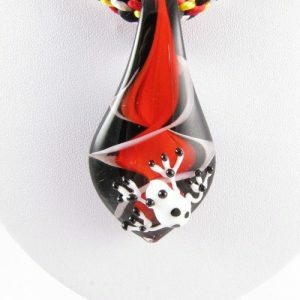 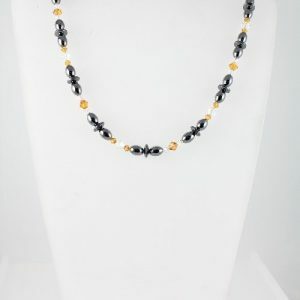 Black and gold lampwork necklace – handcrafted with a black and gold lampwork bead, silver plated beads and acrylic metallised melon beads. 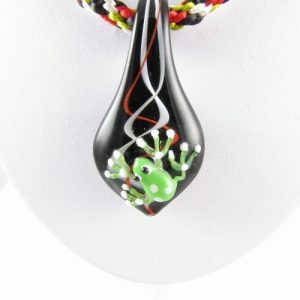 The beads hang on memory wire, which is covered in velour tubing and has an extender chain attached to it. 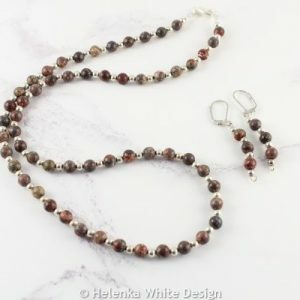 Grey and brown lampwork necklace – handcrafted with a grey and brown lampwork bead, brown glass beads and black and silver Japanese seed beads. 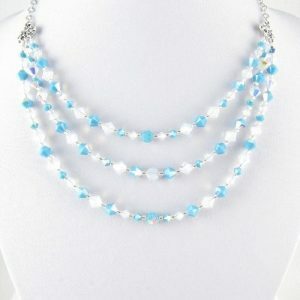 The beads are threaded on memory wire, which closes with an extender chain and a lobster clasp. 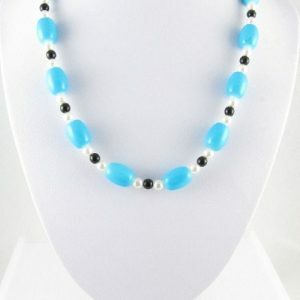 Blue lampwork necklace – handcrafted with a blue and white lampwork bead, blue Indian lamp work beads and matching Japanese seed beads. 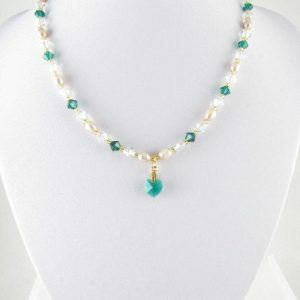 The beads are threaded on memory wire, which closes with an extender chain and a lobster clasp. 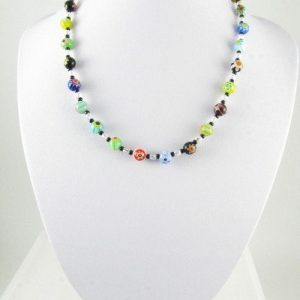 Grey and yellow lampwork necklace – handcrafted with a grey and yellow lampwork bead, and matching Japanese seed and fire polished Czech beads. 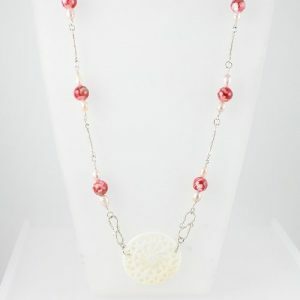 The beads are threaded on memory wire which closes with an extender chain and lobster clasp.